Throughout our 13-year history at cleverbridge, we’ve been fortunate to have attracted some of the most talented people to join us on our mission to transform the way digital businesses sell globally online. cleverbridge, a provider of ecommerce and subscription billing solutions for monetizing digital goods, online services and SaaS, announces that the Illinois Technology Association (ITA) has named cleverbridge, Inc. CEO and co-founder Craig Vodnik a finalist for the 2018 ITA CityLIGHTS CEO of the Year Award. Now in its 19th year, the ITA CityLIGHTS Awards is the premier annual event elevating and honoring achievements from the local tech community. Winners of the awards will be announced at a gala event on September 13 at Morgan Manufacturing in Chicago. The CEO of the Year Award is presented to a CEO who has successfully scaled their company through outstanding leadership, ability to attract and retain talented resources, financial accomplishments and the implementation of strategic growth opportunities. All award finalists are selected by a panel of accomplished judges representing a Who’s Who in Illinois technology. The public can contribute to the selection of this year’s winners by voting from August 6-17 at http://www.itacitylights.com/voting. Winners will be determined by a composite judges score and public voting in all categories except the Industry Champion, which is determined soley by the ITA Board of Directors. This is the second year Vodnik has been named a ITA CityLIGHTS CEO of the Year Award Finalist (2014 and 2018), and the fifth consecutive year cleverbridge has been named a finalist in the ITA CityLIGHTS Awards. The company was named a Lighthouse Award Finalist in 2015, 2016 and 2017, and an Outstanding Technology Development Award Finalist in 2016. Vodnik was named to Crain’s Chicago Business 2017 Tech 50 and a 2016 Chicago Illini of the Year Award honoree for his career achievements and positive impact on the Chicago community. He was also named to the 2015 Techweek100, Chicago Tribune’s Blue Sky Vault, and a 2014 EY Entrepreneur of the Year in the Midwest Finalist. Outside of cleverbridge, Vodnik has continued to help develop other entrepreneurs as a mentor at Catapult Chicago, Junto Institute, University of Illinois at Urbana-Champaign Enterpriseworks Entrepreneur-In-Residence, and as a board member of Hyde Park Angels. He has also helped further the Illinois tech scene by hosting and judging multiple hackathons at the cleverbridge office. 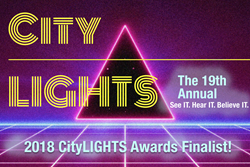 To view the 2018 ITA CityLIGHTS Awards finalists or cast your vote for the category winners, visit http://www.itacitylights.com between August 6-17.